First: this was an exquisite self portrait, very special Andrew, I loved it. Next: this was an incredible post, thank you for sharing so much of your life and thoughts, it was uplifting and inspiring. Third: it is heartening to know people like you – are physicians caring for others and teaching the next generation to care! It would be a lovely thing, if all physicians would. Wow Andrew! I am beyond impressed! 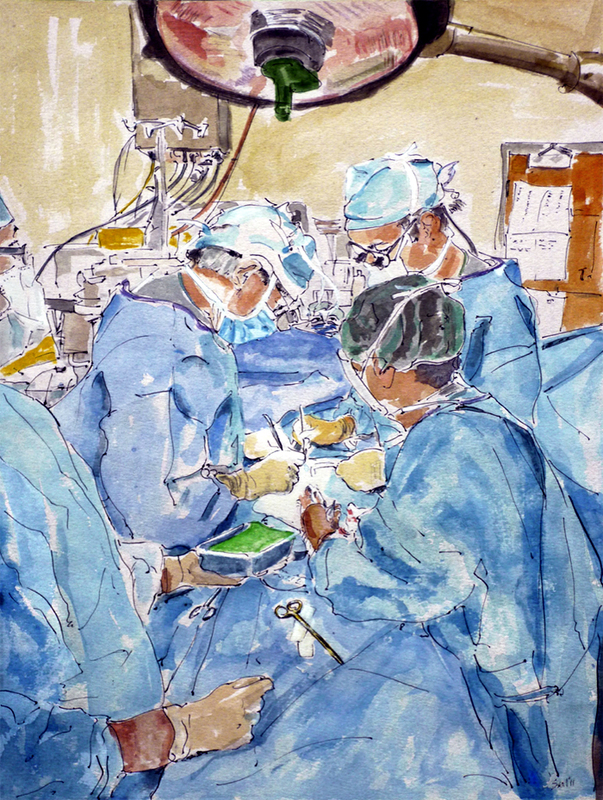 Not only are you an amazingly talented artist but you also served as a surgeon!!!! Wow. You truly are inspiring Andrew. 😊 Thank you so much for sharing more about your life. As someone who gets dizzy with the sight of blood and can’t imagine the years of training and hard work, you truly are admirable. And to have two talents! Beautiful speech. Thanks Mary for your lovely comment. I very much enjoy your writing and photography as you know. Good luck with your studies and enjoy the rest of first year. Best wishes. This portrait is my favourite of all the work I’ve seen from you so far. Beautiful “introduction”. 🙂 Also, I loved what the surgical trainee had to say. “The art of medicine is the ability to convince your patient that you recognize their humanity and see them as a complete human being.” There’s not enough of that in medicine. Come to think of it, there isn’t enough of that in any occupation. Quite a development! 😉 What a lovely address, choked me up a bit in a few places. The world definitely needs more of you. Thank you for this. Your self-portrait is wonderful – warm and intimate, cool and sterile at the same time. It reminds me of my own training, and your address brings back fond memories of your mentoring of my medical school class. Thank you for this. Thanks Martina for your lovely comments, which are so very much appreciated. Those were some of the most rewarding years of my professional life having the privilege of getting to know you and all of your classmates. Hope all is going well for you. Warmest wishes as always. As someone living with chronic pain and illness, I appreciate every word you have written in this post. I have come to learn and discern which of the many doctors and other medical professionals I encounter approaches their work as if it is an art; and how important each patient is to them by the way they touch, listen and speak to me, and the compassion they bring to each of our meetings. Your words tell me that your patients and students have been very fortunate to have you. Thanks so much Ananya for such a lovely comment. Warmest wishes to you. I must say i stumble upon your page and am so happy, Love ur body of work. I personally come from a big artist family… Louise, Mike, Susan & (mom) Neith Nevelson… all different mediums of art sculpture, paintings and textiles….. I am just a pice of work, but Art is all to me. I have my own site here, its not painting but it is my own inspiration of art and magic. I truly love ur hand and how you have evolved from being a surgeon to artist. “Life is short, the Art is Long” truer words could not have been said, and the laying of hands from doctor to patient is so important, it is trust. I who nursed the elderly for many years know this and this job brought me to Le Marche Italy where I reside now. I loved what you wrote above, we are all teachers, students from the time we are born to the time we transcend. I say this because as also a mother of now a 27 yr old, she taught me things as a baby without even knowing and thankfully I am open minded enough to have learned and am still learning from all who i encounter everyday. Thank you Andrew for having this place here, I am glad i stumbled upon it. I visited one of our universities open days with my daughter who is about to become a student. I could feel her excitement as the different lecturers did their best to attract the best students to the best course being theirs.. I will ask her to read this. I needed to read this as a patient for I am reading Gabor Mate’s book on The realm of a hungry ghost. It takes so much as a person never mind as a physician to heal. As for art on painting, I thorough enjoy paintings since my brother is one and we will be visiting Art Vancouver in April.